During this year’s NFL playoff season, Lexus is having fun with the hotly debated "roughing the passer" rule. The rule, designed to better protect quarterbacks from physical harm, has sparked no shortage of controversy — with fans, analysts, coaches, defenders and quarterbacks alike questioning whether its enforcement has gone too far. 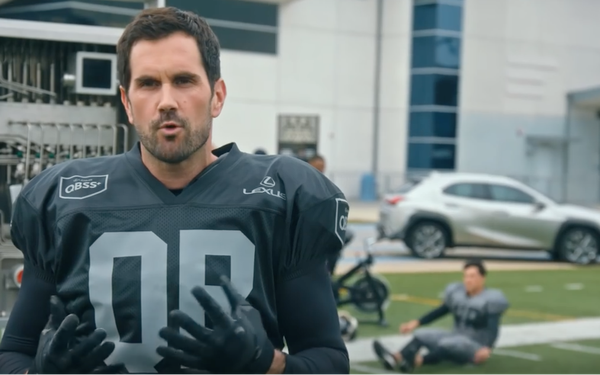 In response, Team One created a campaign starring Heisman Trophy winner and former quarterback Matt Leinart. The 4:08 long-form video, which starts with the disclaimer “No Quarterbacks were harmed in the making of this film,” was directed by Nick and Charles of M SS NG P ECES of “Funny or Die” fame. It reveals a suit of “innovations” designed to make quarterbacks untouchable. The automaker says the “Quarterback Safety System” was inspired by the standard safety system in the Lexus UX compact crossover, which launched earlier this month. The UX actually includes such features as low-light pedestrian detection, daytime bicyclist detection technology, and built-in cameras that help provide road sign information. The QBSS, detailed on a microsite, includes a “360 Pocket Protection Camera,” which gives quarterbacks a bird’s-eye view of the pocket and more time to move outside the tackle box to find the optimal safe position to throw the ball away. “Boo Dampening” blocks boos and converts criticism into positive reinforcement to protect the quarterback’s vulnerable ego. A “Blind Side Monitor” lets quarterbacks know the exact moment they need to fall into a fetal position to avoid a tackle. In addition to the long-form video, the campaign includes pre-roll on NFL.com, GIFs, paid social, and the YouTube masthead on Feb. 2. A 30-second cut-down of the video will air during championship season starting with the Pro Bowl on Jan. 27 on ABC/ESPN, with additional airings on NFL Network and ESPN/ESPN2.